The Index opened flat but saw huge buying interest from the onset to scale 8100 within the first few hours of trade and closed near the top at 8124.45, huge gain of 102.05 points. The broader market was also strong, with 1031 advances to 425 declines. The broader range as per Option Table stays at 7800-8500. 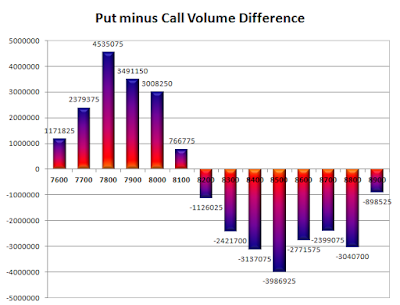 Call option 8400, 8700 added 5.30 lacs OI with short covering seen at 8100 and below strike prices. Put option 8100-7800 added huge 15.37 lacs OI with profit booking seen at 7700 and below strike prices. Nifty Open Interest is at 1,54,08,525 down by 9,70,425, with increase in price, most probably huge short covering. 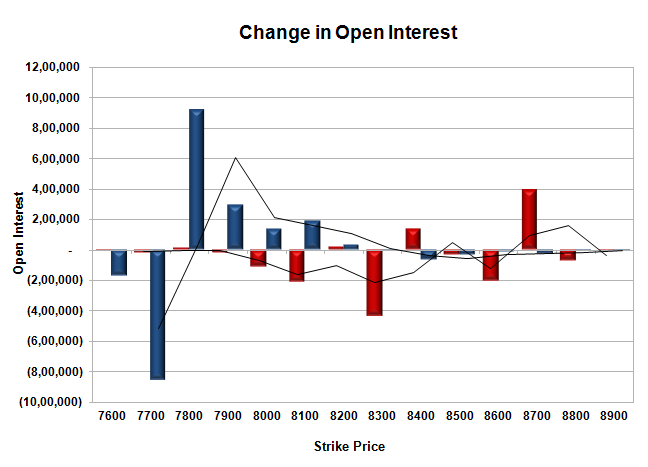 Bank Nifty Open Interest is at 21,99,150 down by 1,39,275, with increase in price, most probably huge short covering. 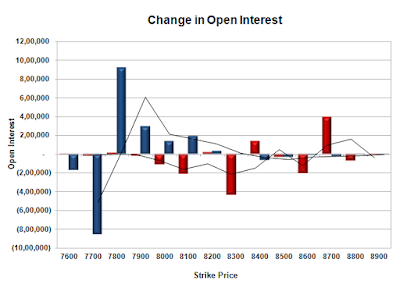 FII’s bought 0.63 lacs Futures, which includes 17849 contracts long liquidation and 20361 contracts short covering, with decrease in net OI by 38210 contracts (includes 109212 longs to 106700 shorts for the day) and the Average Price comes to 8499.79. FII’s Index future open contract as on date is 319749 Longs to 305101 Shorts, Net Long 14648 contracts. 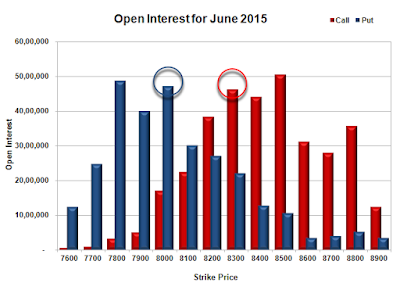 Initial support at 8100, with OI of 30.12 lacs and below that at 8000 with huge OI of 47.07 lacs. Initial resistance at 8200, with OI of 38.27 lacs and above that at 8300 with OI of 46.29 lacs. Day Range as per Option Table is 8031 - 8185 and as per VIX is 8052 - 8197 with 8100 as the Pivot.